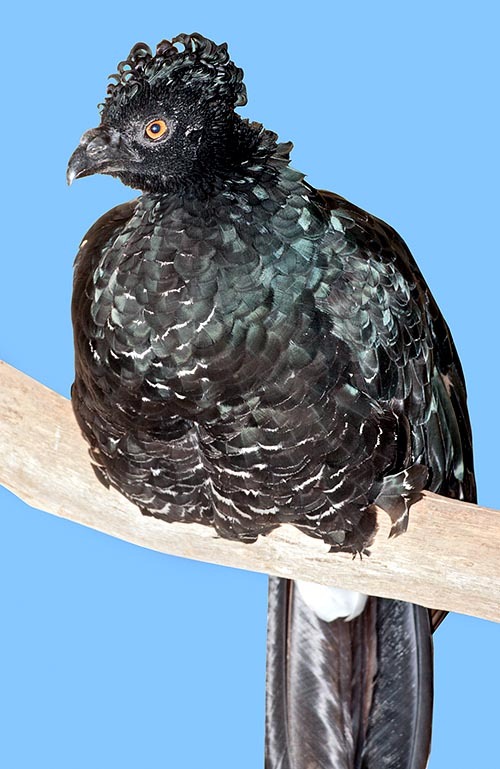 The Yellow-knobbed curassow (Crax daubentoni G.R. Gray, 1867) is a big bird belonging to the order of the Galliforms (Galliformes), to the family of the Cracids (Cracidae), to the genus Crax and to the species Crax daubentoni. The species is monotypic and is distinguished from the other species belonging to the genus Crax mainly due to the peculiar look of the female. The name of the genus “crax” comes from an unspecified Greek term which, even if the etymology is uncertain, might mean “crest” as well as “shouter”, both typical of these galliforms furnished with an erectile crest of feathers and of vocalizations characterized by loud whistles. The name of the species comes from the French naturalist and physician Louis Jean-Marie D’Aubenton (1716-1799) to whom this bird is dedicated. The species is native and is localized to a geographic area in northern Venezuela and, contiguously, in the adjacent Colombia. In Venezuela, it is present east of the Paria peninsula but is absent south of the Orinoco. More westward, is present towards the Arauca River and at the boundary Venezuela-Colombia where it has been found in Isla de Charo. The species is also present on the mountains at the extreme north-east of Colombia near the boundary with Venezuela; south-east of Norte de Santander and in the north-western provinces of Arauca. Northward, it is fund at the feet of the Sierra de Perija, almost up to the Caribbean where it is known from the Mountains de Oca and in the Sierra Negra and east of Fonseca. Its range is separated at the feet of the Santa Marta Mountains, where lives Crax alberti, by a narrow belt of territory probably not suitable for its settling. Even if the species is found at the feet of the mountains and in other different locations, it is, like the other curassows, a tropical distribution range bird. The largest number of specimens are found in the gallery forests of its own range where is, or was, and abounding bird. In the rest of the territory, being a somewhat particular species, has a localized distribution. It is present also in the foothills and in the countries alternated with forest. It frequents also the dry woods with deciduous vegetation, often close to rivers or in small valleys where a humidity rate greater than in the surrounding zones favours the growth of a forest more suitable to the species. In the vast flat and marshy plots of the wide territory of the Llanos, during the dry season, the yellow-knobbed curassows gather close to the water streams and the puddles of water which rest to the drought. Aggregations of even fifty, hundred or more individuals have been reported; but these abundant flocks unluckily were a thing of the past which has gone lost due to the greater human settlement in such geographic areas. The yellow-knobbed curassows frequent altitudes between the 100 and 500 metres in Venezuela and between 500 and 1500 metres in Colombia. The species is absent in the mountain forests where is present the helmeted curassow (Pauxi pauxi) and in the plains pluvial forests where lives the crested guan (Penelope purpurascens), it does not even love the too much dry bushy zones. The sexual dimorphism is present in this species; the weight varies from 1.625 to 3.200 kg. The male has a livery substantially black with a bit shiny look and with very dark green-blue reflections especially in the dorsal parts. The abdomen, the tufts of the back feathers of the thighs and the tips of the outer rectrices of the tail, are white. It has an ample, erectile, crest of feathers. 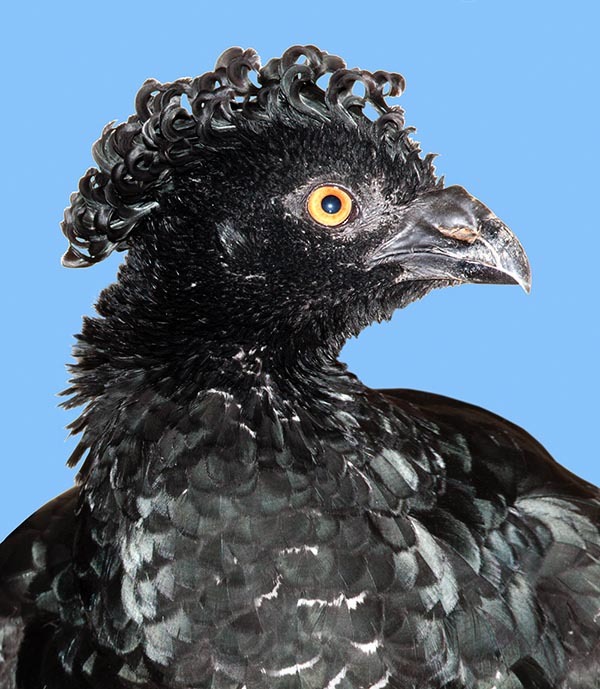 The feathers of the tuft are, like the other species of curassow, typically twisted and curled thus forming this peculiar crest-tuft. The beak, black, is big, massive and robust. It has modest bright yellow wattles like the evident spherical knob of bare skin which stands above the dorsal part of the beak. The yellow skin covers also the base of the beak up to half of the same. The male curassows have very dark iris, the legs are horn-slate coloured legs with 93-113 mm long tarsus. The female, also mainly dark, is more similar to its male than the other species of curassow where the females distinguish more from their relevant husbands. As we said, she also has a dark livery, but with the underlying parts barred with white, excepting the abdomen which is white like in the male. The bars are about 1/8 of inch wide, two for each feather, spaced of ½ of inch each other. The crest, present in the female too, is moderately barred with the white of the bars often limited to the basal part of the crest itself and visible only when the feathers of the tuft are well separated (with open erect tuft). The females have blackish cera and face and eye with whitish-bright pale brown iris (in any case always decidedly paler than that of the male). The wing is 385-410 mm long in the male and 356-390 mm in the female. The tail is 325-370 mm long in the male and 306-360 mm in the female. It nourishes on the soil as well as on the trees in small family groups (3-4 individuals), or, during the dry season, in more numerous groups formed up to a maximum of a fifteen birds. The food consists in vegetal essences of various types, like seeds, leaves, fruits and small animals. It reproduces in June in the Venezuelan Llanos and therefore the nesting begins at the starting of the rain season. In this species the male, during the mating season, emits a cry that is a prolonged and acute whistle similar to that emitted by the wattled curassow (Crax globulosa). The whistle is emitted keeping the beak open. After some researchers, during the reproductive season, the trachea of the male gets some slight physiological modifications becoming more swollen and slightly bent. It seems that the males are territorial because, in the wild, they have been heard emitting their whistles more or less constantly from the same zone. Their whistle, when overlapping that of other nearby specimens, becomes a sort of a mournful prolonged whistle which, if emitted by 8-10 specimens at the same time has a very particular effect and well known by the natives who call these birds “Poru”. Some authors advance the hypothesis that the species can be polygamous, with the male who should mate with more females, but considered the ascertained documented monogamy for other similar species of curassow, this statement seems dubious. It is not easy these birds on the ground. When they perch on the branches of the trees they often sing and raise the feathers of the tail opening them like a fan exposing the white feathers of the undertail and becoming more visible for a possible observer. If disturbed, they emit a generally stronger whistle, clearer and shorter than the usual whistle, slow and mourning. The nest is built on the trees or on the soil and is formed by a mass of twigs and other material of vegetal origin. They spawn two big eggs per clutch, incubated for about 30-32 days by the female. The just born, chicks are nidifugous and already able to effect short flights being already equipped with flight feathers. They can, therefore, perch high up on the branches since their first days of life. Their mimetic down feather is streaked and spotted with brown-tan-black-yellowish. The parents give the food to the young directly from their own beak to theirs; the newborns are however capable, since the first days of life, of actively looking for nourishment. The first feathers of the young are brown. The young having the size of ¼ of the adult already show the livery permitting to distinguish the males from the females and have the crest already well developed. They appear therefore as adult individuals in miniature. The plumage of the immature is in any case streaked and edged of brown. This species, in captivity, is present especially n the origin locations and it has always been rather scarce in the zoos and at the European and American breeders. When bred out from its original tropical habitat, the yellow-knobbed curassow has revealed more sensitive to the cold in respect to other similar species. The species was common in the llanos and in other areas but has suffered a decrease due to the extensive conversion of many lands in rice fields. The species is sheltered in some livestock farms and in some natural areas.